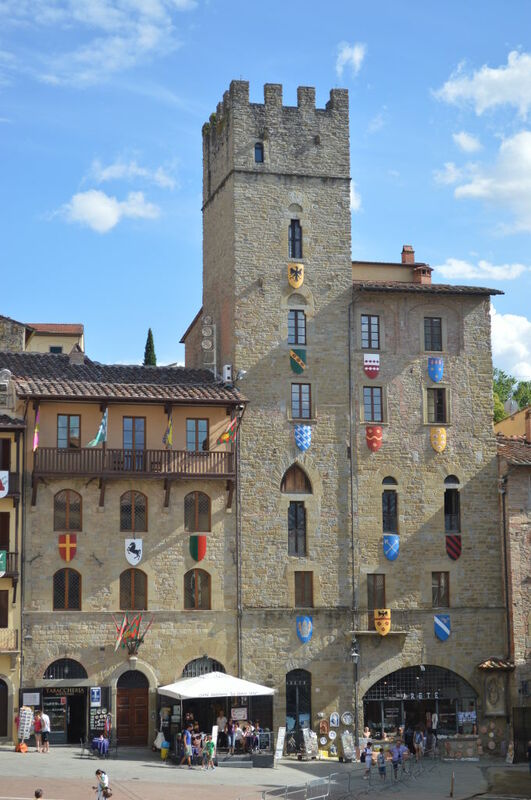 Arezzo, with its very ancient history, is a melting pot of art, culture, architecture and history. 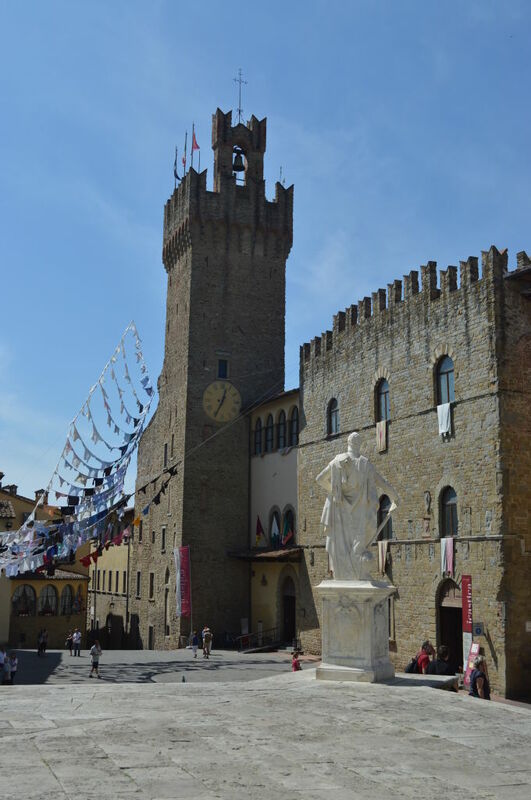 Maybe it will be easier for us to quote what NOT see in Arezzo, because the city is an open air museum of medieval history. 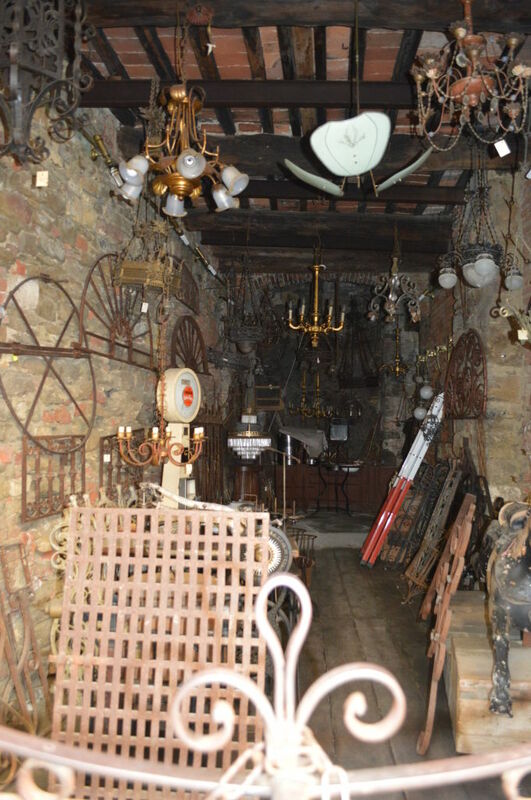 Our suggestion is to decide a starting point (B&B Antiche Mura in Piaggia di Murello, for example) and start walking: in every corner there is something to see, so you just have to stop by and give it a look. We’d like to give you some suggestions about what is really worth seeing. For example, if you start from the B&B Antiche Mura, you could walk east, towards Via Ricasoli (uphills, if you don’t have a compass!) 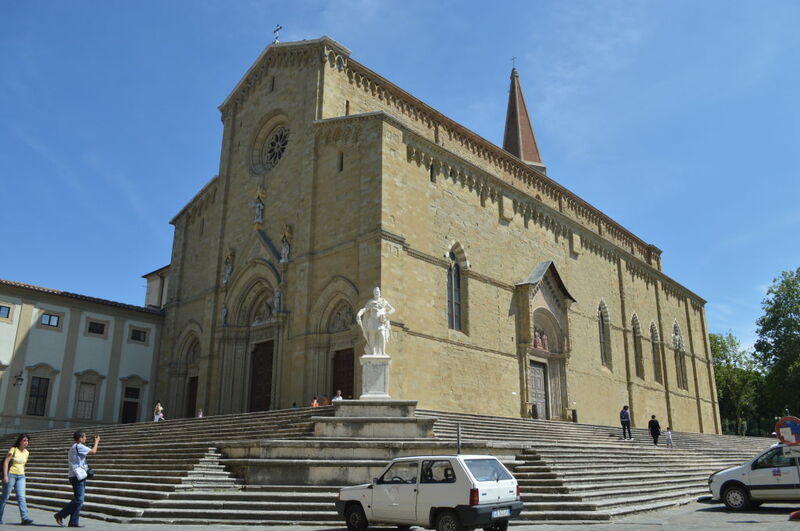 and you’ll end up just in front of the Cathedral of San Donato: it’s located on top of the hill of Arezzo near to the Fortress and due to its position and majesty, it is visible from every place. It was designed by Margaritone and its construction began at the end of the 13th century. The Cathedral was completed in the 16th century, but its facade was realized in the 20th century. 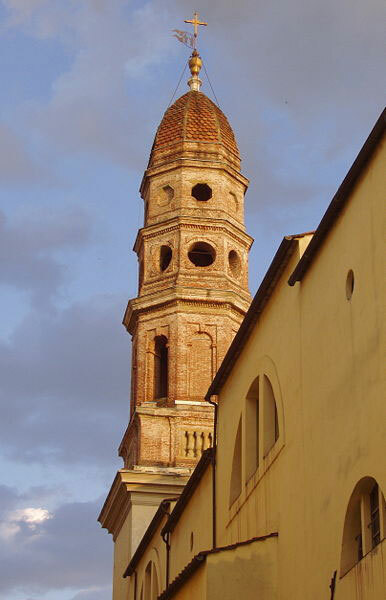 The campanile was erected half way through the 19th century next to the polygonal apse. Inside the Cathedral there are wonderful and important works of art, like the “Maria Maddalena” by Piero della Francesca , the stained glass windows by Guillaume de Marcillat, the Funerary monument of Guido Tarlati and the Main Altar from Giovanni Pisano. 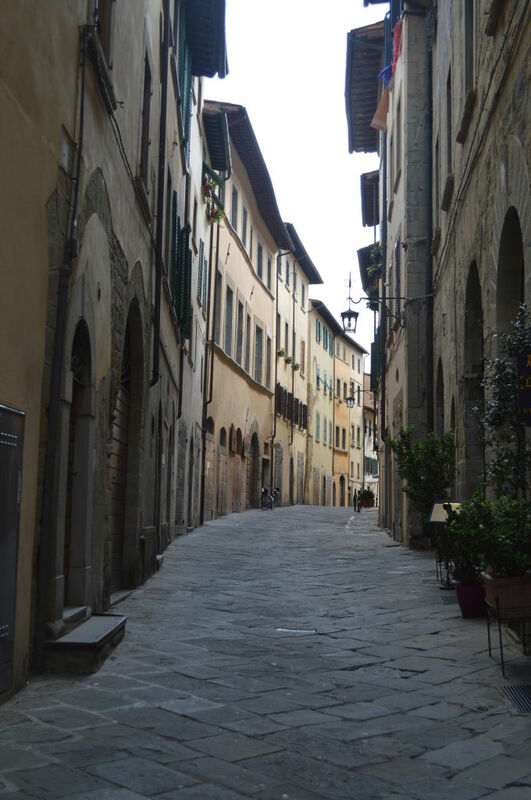 Walking down Via Andrea Cesalpino, you can find on your right the Arezzo’s city hall, which is placed in Palazzo dei Priori. 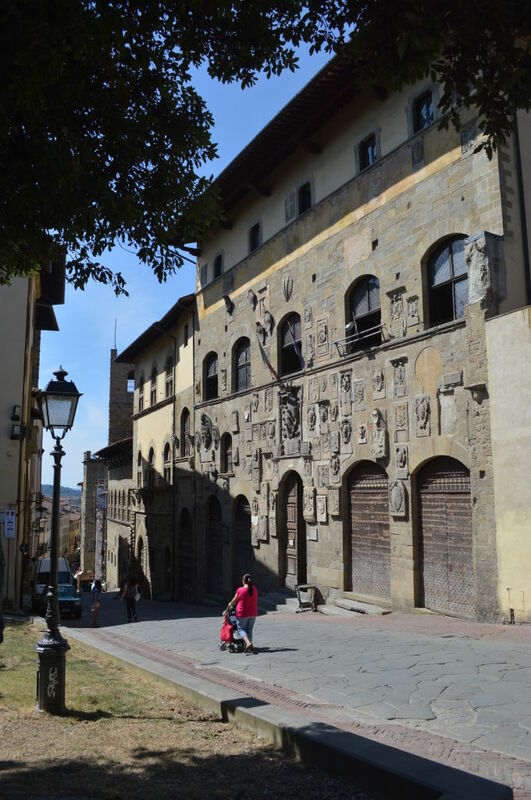 It was built in the 14th century and it has got a characteristic tower where you can find frescoes by Parri di Spinello and Teofilo Torri; you can also find paintings by Giorgio Vasari. A couple of blocks forward, on your left, you can find Via della Bicchieraia: if you take this street, you’ll end up in Corso Italia, right in front of Santa Maria della Pieve, an impressive church in Romanesque style. The church’s most striking feature is its façade, with a five-arch lower floor surmounted by three loggias, with the number of columns increasing with the elevation. The columns, and its capitals, are each different from the other and one is a statue. The counter-façade has nine windows on three rows. At the high altar is the Tarlati polyptych, representing the Madonna and Saints, by Pietro Lorenzetti. The bell tower looks very solid and shows five rows of mullioned windows. 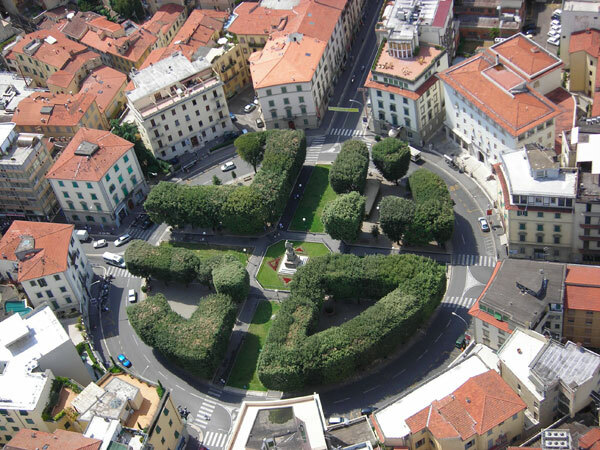 By walking beside the Church, the amazing Piazza Grande will enroll right in front of your eyes. Piazza Grande, with its unique shape, is one of the most scenographic and evocative squares in Italy. 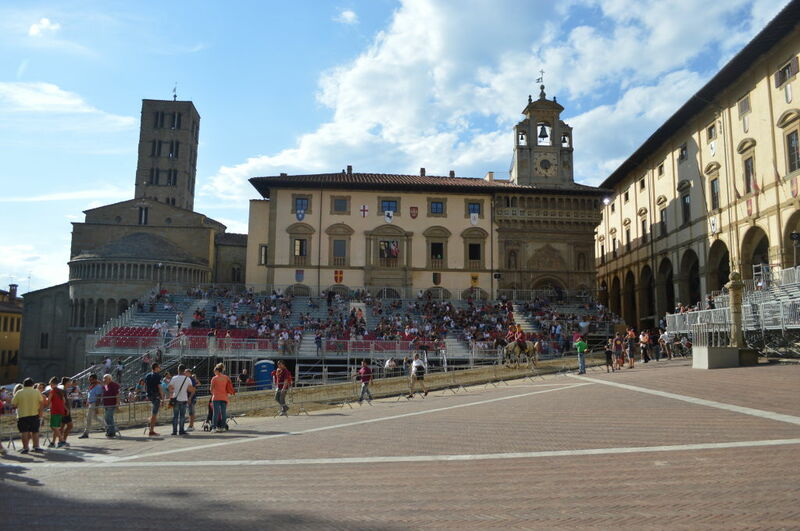 It is also known as Piazza Vasari, thanks to the amazing loggiato designed by Vasari himself. Palazzo delle Logge was designed by Giorgio Vasari in 1573 and it definitely modified the urbanistic structure of the square, which had already been altered by the collapse of the Palazzo del Comune and the Palazzo del Popolo: its construction required the reduction in size of the old platea communis and the occupation of a whole side with an uninterrupted wall. The final result, anyway, was harmonious, thanks to the simplicity of the architecture and the luminosity of the long portico, under which are situated the entrances to the old shops with their characteristic spallette (little parapets). 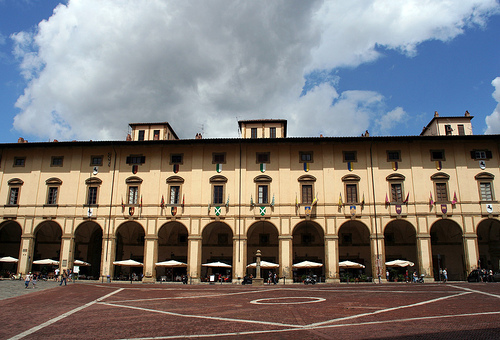 Though the building of Palazzo delle Logge was very controversial, today it’s a unique masterpiece and a symbol of the city of Arezzo. Another important building in Piazza Gande is Palazzo Lappoli, which dominates the southeast side of Piazza Grande, which is made up of a row of old houses characterized by high and narrow facades, decorated with wooden balconies. 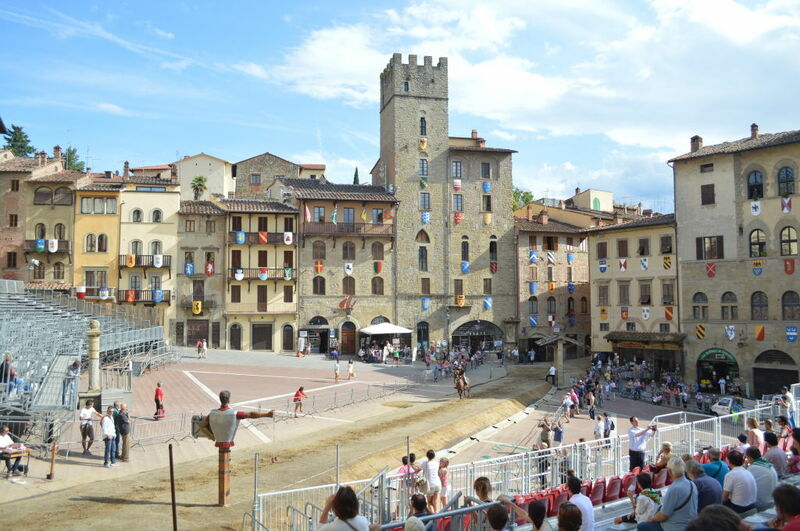 A well-known antiques market and the Giostra del Saracino, a historical pageant with a challenge between the four districts of the town, are held here. The Court House, the Palazzo della Fraternita dei Laici, the Palazzo delle Logge and the apse of the Romanesque parish church, or pieve, of Santa Maria all face onto the square. 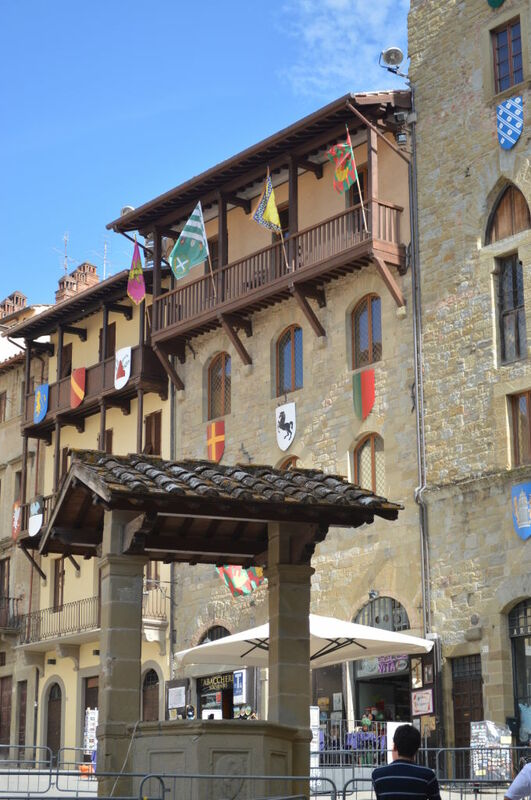 On the ground floor of the Medieval buildings surrounding the square, you can shop in the most characteristic antiques shop in Arezzo. On Piazza Grande is standing Palazzo della Confraternita dei Laici: it was built in three different epochs, but the result is wonderful. 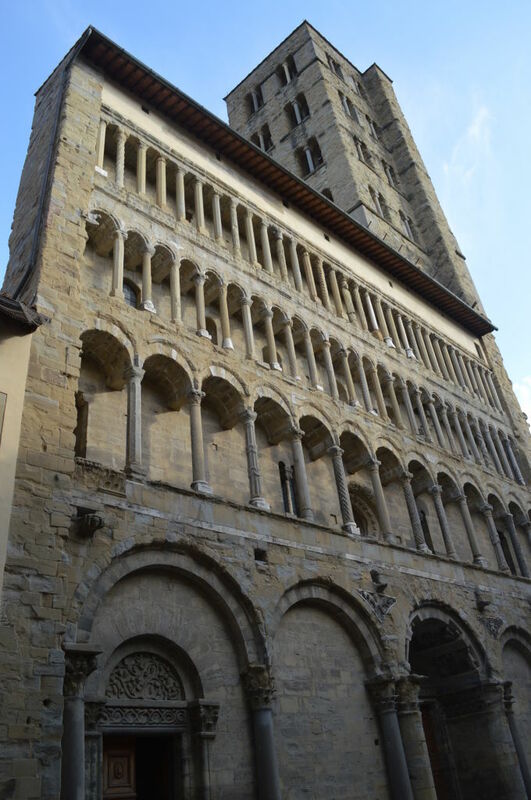 The lowest part of the building is Gothic (14th century), but it was completed in Renaissance style by Bernardo Rossellino in the 15th century. The bell-gable was designed by Giorgio Vasari (16th century), and it houses one of the oldest working clocks (Felice da Fossato, 1552) that indicates hours, days and the phases of the moon. 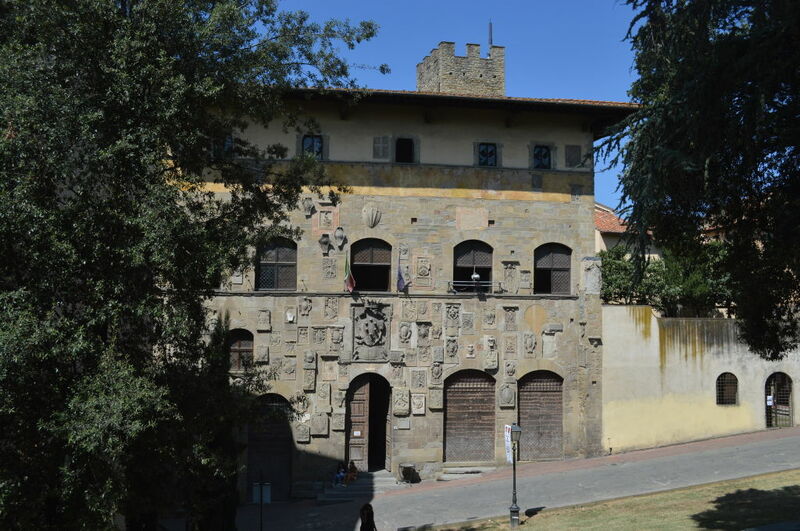 Walking up beside the Vasari Loggiato, passing through Piaggia San Martino, you can easily reach in a few steps the Medici Fortress, built in the 16th century by the Medici family of Florence; it’s located on top of the hill and it offers a wonderful view around the city. 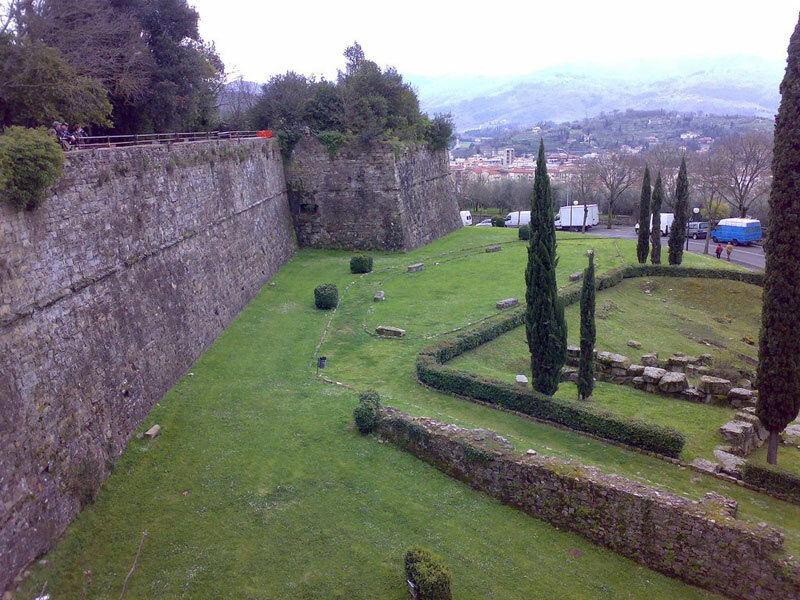 Gardens, called “Prato”, are all around the Fortress. From the fortress, you can walk down again towards Piazza Grande (give it another look because it deserves it!) 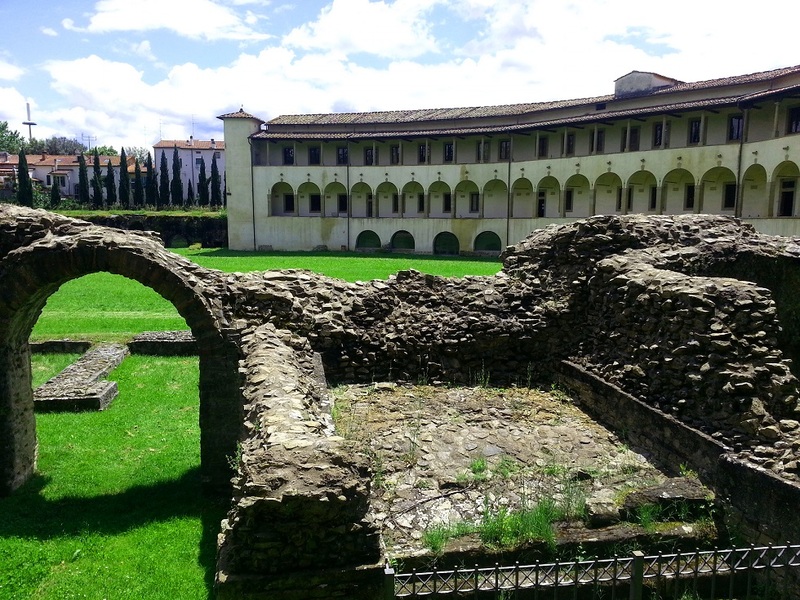 and then reach the Roman amphitheater, which is located in the southern part of Arezzo and can be reached both through Via Margaritone and Via Crispi. 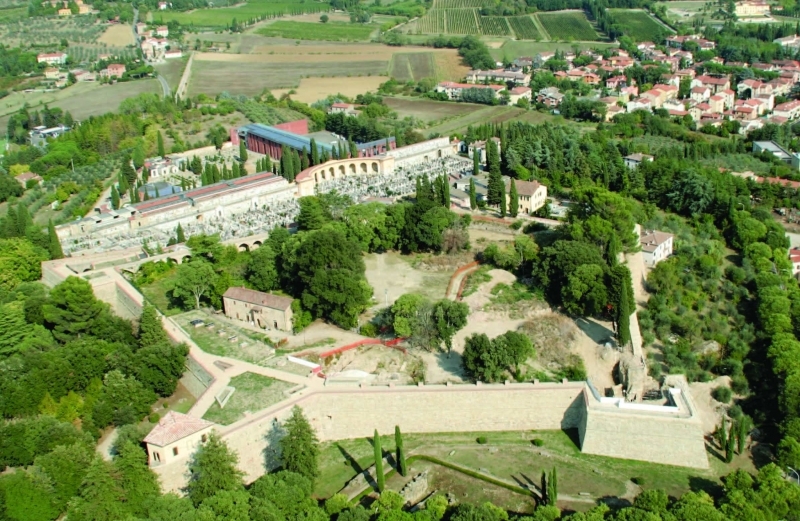 The amphitheater was built between the end of the 1st century and the beginning of the 2nd century A.D. with blocks of sandstone, bricks and marble; it has an elliptic shape and it could probably contain eight thousand people. After visiting the Roman Amphitheatre, you could walk to Piazza Guido Monaco, a circular square dating back to the 19th century and placed at the crossroad between Via Guido Monaco and Via Roma. In the centre of the square, which has a diameter of 100 metres, there is a monument to Guido Monaco, by Salvino Salvini. The square does not have a high historic importance, but if it’s a warm day and you feel like walking, it’s worth seeing, since it’s very well planned and kept. Definitely more interesting are the churches you come across, while walking back to North. 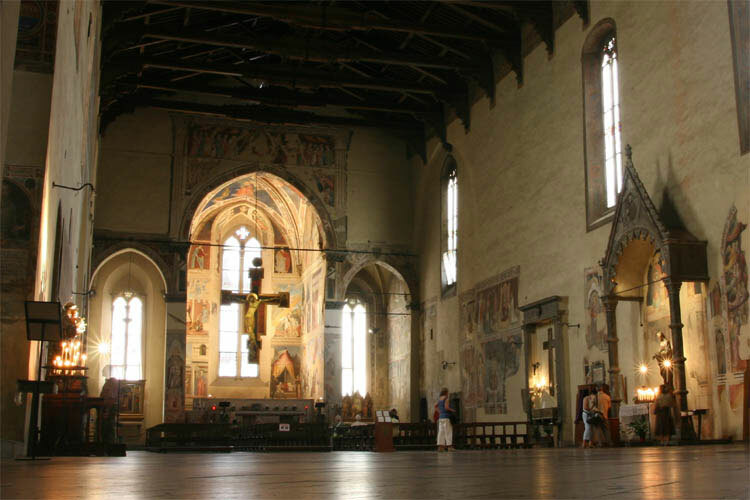 The first one you meet and can visit is the Church of Santa Maria in Gradi. It dates back to the 11th/12th century, but was re-done in a manneristic style at the end of the 16th century, following a design by Bartolomeo Ammannati. The brick campanile was modified in the following century. The single nave interior contains a very interesting Madonna of Mercy, a 15th century terracotta by Andrea della Robbia. 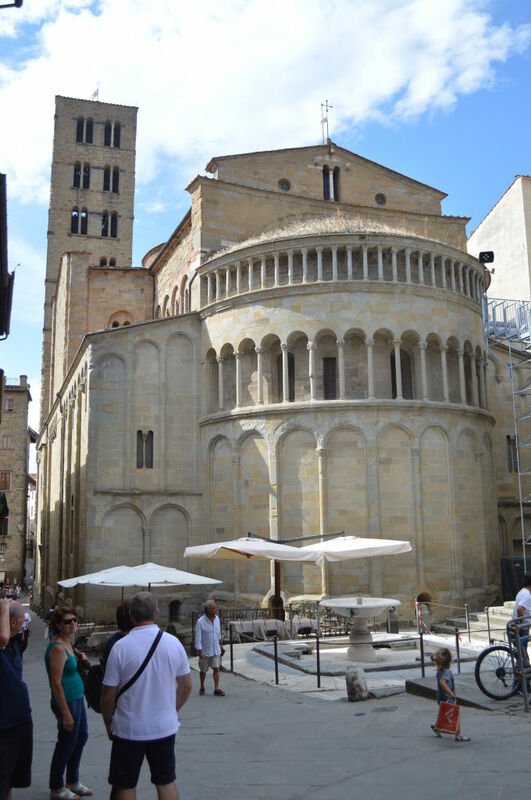 Further north, you can find the Basilica of San Francesco and the Badia of Santa Flora and Lucilla. 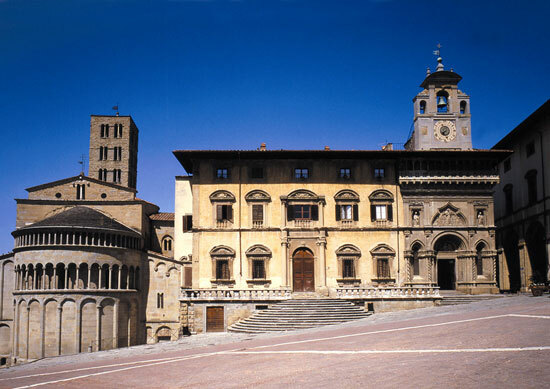 The former (placed on Piazza San Francesco) dates back to the second half of the 13th century. Its current appearance, however, is the result of a 14th century Tuscan Gothic restoration, which was inspired by criteria of aesthetic simplicity from Franciscan priests. The magnificent single nave interior has been almost completely restored to its original simplicity. You can see on its right, shrines from the 14th century and reinassance ornaments and, on the left, plain ogival chapels. Anyway, the attention of the visitor is attracted, above all, by the fascinating scenes of the Legend of the True Cross painted by Piero della Francesca on the walls of the central apse between 1453 and 1464 circa. The Badia of Ss. Flora and Lucilla is a church placed in Piazza della Badia, built by the Benedictine monks during the 13th century and dedicated to the Saints Flora and Lucilla. 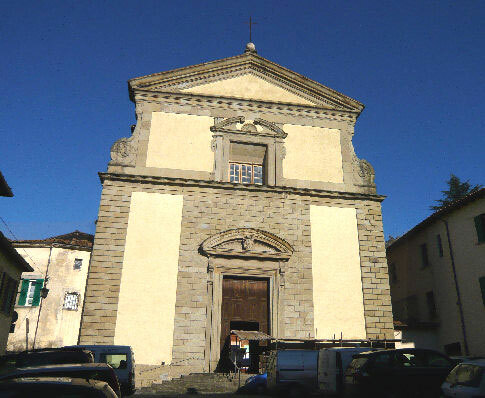 In the middle of the 16th century, the church was completely restored according to a project by Vasari. The current facade is the result of a desputable early 20th century restoration of Romanesque-Gothic inspiration but the great mullioned window, part of the portal and the side facing via Cavour are original and the manneristic interior shows the genius touch of Vasari; the main dome, an illusion created by false perspective on canvas, was realized by Andrea Pozzo. In this church there is a lot to see: as a matter of fact, to the left of the entrance, there is a fresco of S.Lorenzo of considerable interest, by Bartolomeo della Gatta; on the right, there is a wonderful Cricufix painted on wood by Segna di Bonaventura, and near the altar, which is made of wood and was originally built by Vasari there is a marble ciborium, which is tough to be made by Benedetto da Maiano. 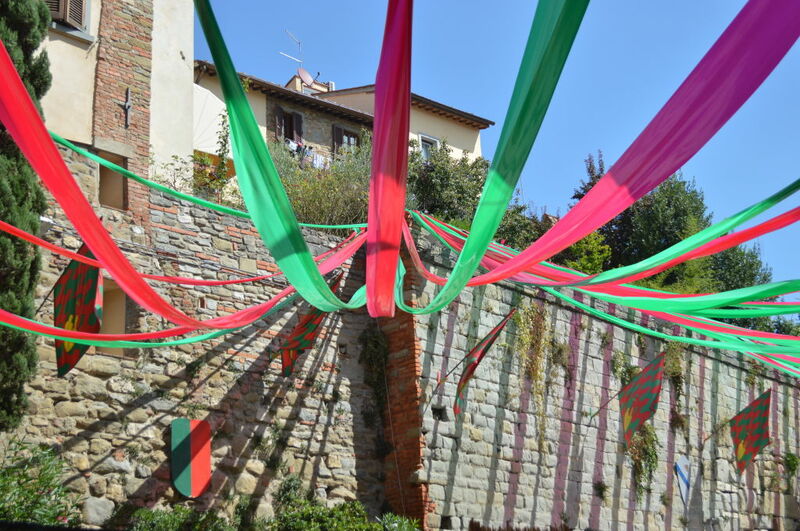 From here, if you had enough of walking around Arezzo and your feet are asking for revenge, you are just a couple of steps away from your starting point, the B&B Antiche Mura, where you can finally rest! On the other hand If you are fond of churches, there are others to see along your way, like Church of Ss. Annunziata, along Via Garibaldi and Church of San Domenico placed in Piazza San Domenico. Other curiosities to see if you have some more time are: the Chimaera statue under the Porta di San Lorentino. The statue under the door is actually a copy of the most precious original statue, which is currently the Archeological museum in Firenze. 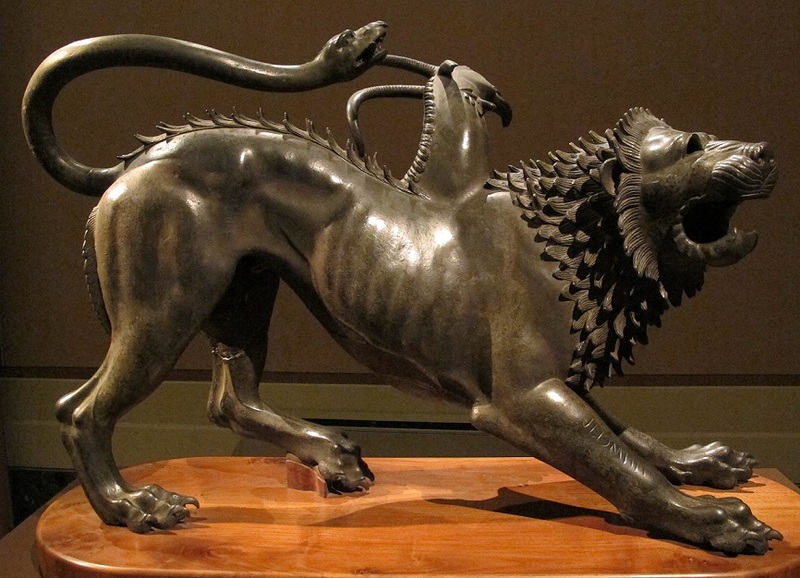 The Chimaera of Arezzo is a bronze statue which was found in Arezzo, in 1553. Of Etruscan origin, probably from 5th century bc, it is one of the most beautiful examples we have of ancient Etruscan art and supposedly it was made as a vow. 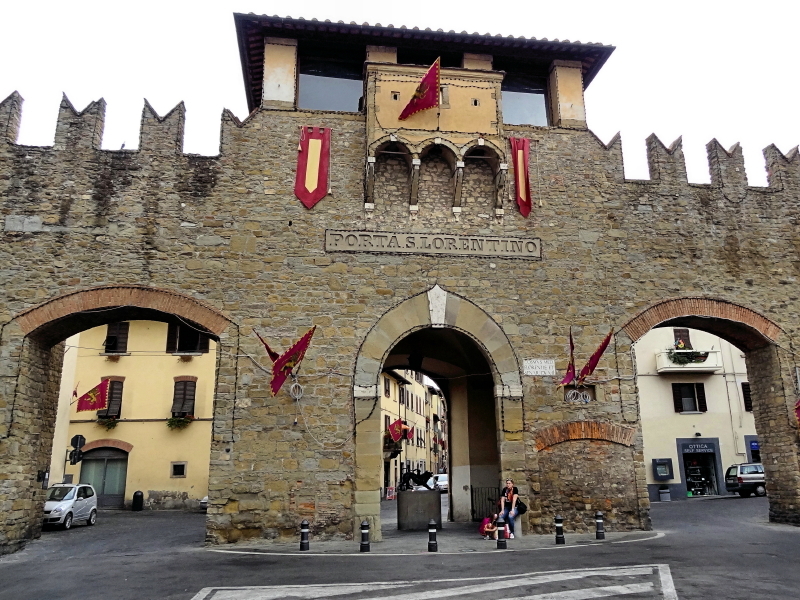 The archives of the city of Arezzo, in Italy, report the discovery of the “Lion found outside the S. Laurentino Door”, that’s why it’s placed there as a symbol of the city of Arezzo. The Chimaera represents an animal with the body and head of a lion, part goat and a snake like tail. 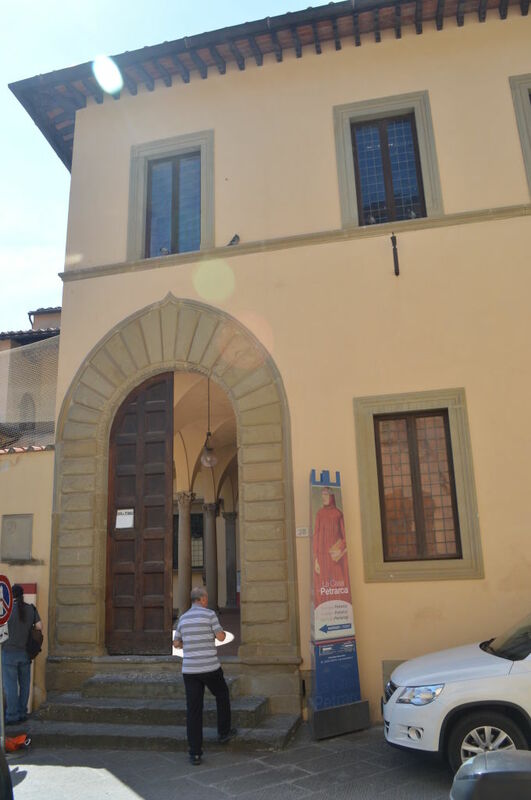 Last but not least, if you are a lover of Italian literature, you may be interested in visiting the house of Francesco Petrarca, placed in Via dell’Orto No. 28. Petrarca was an Aretine scholar and poet in Renaissance Italy, who lived between 1304 and 1374 and one of the earliest humanists. He would be later endorsed as a model for Italian style by the Accademia della Crusca. Petrarch’s sonnets were admired and imitated throughout Europe during the Renaissance and became a model for lyrical poetry. He’s known especially for his sonnets dedicted to a woman called Laura, which are the highest examples of courtly love poetry. The house you can visit today was built in the 16th century on the remains of a medieval building traditionally held to be Francesco Petrarca’s birthplace. It was half destroyed in the last world war but has been rebuilt and now houses the Petrarca Academy of letter, Arts and Sciences (together with its library). Entrance is free and the opening hours are 10:00-12:00 am/3:00-5:00 pm. Closed on Sundays afternoon and on holidays. You must be hungry after so much walking: go and see our selected restaurants!